Anna-Maria Galea reviews the recent The Windrose Project, a Valletta 2018 initiative to safeguard our cultural heritage by recovering memories from all four corners of the Maltese archipelago. Kite-making workshop participants flying their kite during Winds Bring Gifts Ashore at Exiles Beach, Sliema. In this digital age, news, especially of the global variety, has become something of a cheap commodity. This is mostly due to its easy availability and the fact that almost everyone with a keyboard feels the need to give a not-always appreciated opinion. In an almost ironic twist, despite the readiness with which one can find globally relevant (and irrelevant) information, home-grown material – and, indeed, local stories which were once the domain of village elders – have started to fade more and more into the fringes of oblivion. It was in an effort to safeguard our cultural heritage that The Wind-Rose Project, a Valletta 2018 initiative, was created by The Rubberbodies Collective to recover “memories from all four corners of the Maltese archipelago... The works touch on a time-old connection to the elements and natural rhythms”. The Wind-Rose Project, which has been three years in the making, was not just limited to one location of importance. And, instead, four geographically important sites were carefully selected in both Malta and Gozo: Għarb, Gozo’s westernmost village (the name itself meaning ‘West’ in Arabic), Marsaxlokk, intimately associated with fishing and located in the South-Eastern part of Malta, Sliema, Malta’s foremost urban coastal centre and Mġarr, an isolated hamlet minutes away from the coast. After identifying these areas and initiating conversations with the local communities, a representative was chosen from each area and by working closely with the artists, they were able to contribute to the design and shaping processes of each of the four wind vanes which were later showcased at Saint James Cavalier. The wind vane laid down at Exiles Beach, Sliema, was the first out of the four to be unveiled to the public. 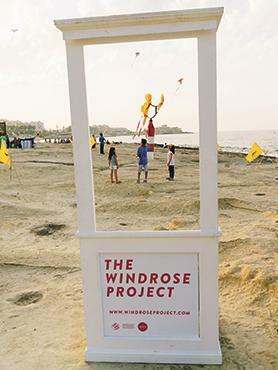 The first out of four weather-vane sculptures was unveiled on July 1 at Exiles Beach, Sliema, as part of the Windrose Project produced by The Rubberbodies Collective and part of the Valletta 2018 Cultural Programme. There is no mistaking the Sliema wind vane’s connection to the sea, as the symbol used to represent this once breathtaking coastal town, which has now become a playground for concrete block high rise buildings, is the sea bream, or kaħlija. Although it has been described as being a once-quiet fishing village, Sliema’s relationship with the elements has greatly dwindled, thanks to urbanisation. This made the unveiling of the wind vane at Exiles Beach even more of a poignant event than one would have expected. 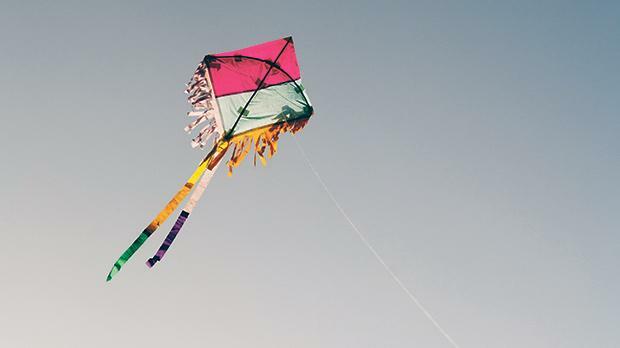 Using “the saddle bream’s reputation as a challenging, yet rewarding, recreational catch,” The Rubberbodies Collective found fertile ground for the wind vane’s introduction to its final resting place, and even took the opportunity to prepare the surroundings for its new guest. Not only was there a performance piece where girls in gaily-covered outfits wove in and out of the audience, but a few hours before the vane’s unveiling took place, an underwater clean-up of the bay by Dive Systems and Calypso Sub-Aqua Club saw volunteer divers provided with free tanks of air in order for them to be able to clean up any underwater debris. 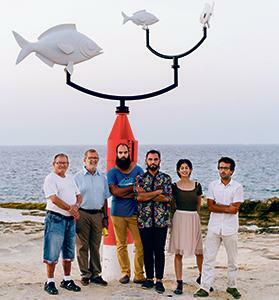 From left: Leli Camilleri, president of Fishermen Association Exiles Sliema, Mayor Anthony Chircop together with Matthew Pandolfino, Adrian Abela Martina Buhagiar and Jimmy Grima, the artists behind the project, at Exiles Beach, Sliema, after the unveiling of the weathervane. 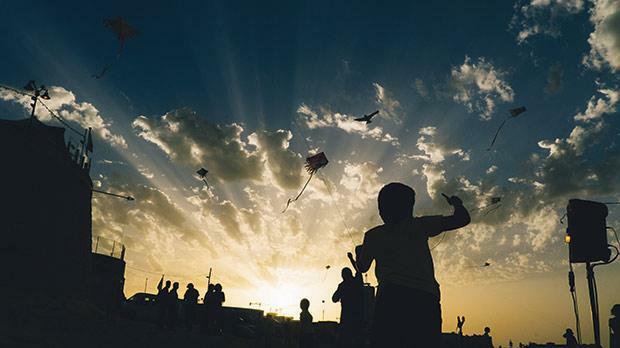 In keeping with the all-important educational aspect of The Wind-Rose Project, in 2015, The Rubberbodies Collective had organised a children’s workshop dedicated to making kites and, in keeping with the linearity of the project, children from the first Sliema Scout Group and Sliema Salesian Brigade were present with kites of their own creation to usher in the new structure. Asked for his comments about The Wind-Rose Project, Sliema councillor Pierre Portelli provided some very valuable insight: “Projects such as this one are invaluable to the Maltese cultural consciousness as they provide a deeper and richer understanding of Malta as a whole and raise awareness about nature and the importance of remembering our roots.